Grate the frozen butter on the large holes of a box grater, then keep in freezer until needed. 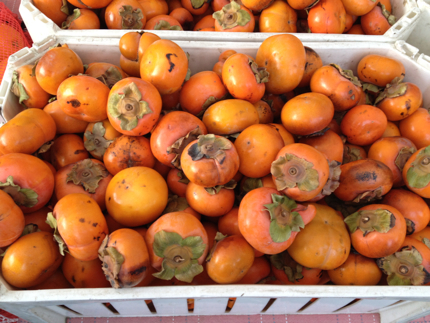 Place diced Fuyu persimmon in freezer until needed. Whisk the milk and greek yogurt together and refrigerate until needed. Whisk the flour, sugar, baking powder, baking soda, lemon zest, and salt together in a medium bowl. Add the frozen grated butter and toss with your fingers until thoroughly coated. Fold in the chilled milk mixture with a rubber spatula until just combined (do not over mix). Turn out the dough and any floury bits onto a well-floured counter. Lightly flour your hands and the dough and knead the dough gently 6 to 8 times until it just holds together in a ragged ball. Roll out the dough into a 12 inch square. Fold the top and bottom of the dough over the center, then fold up the sides of the dough to form a 4-inch square. Transfer the dough to a lightly floured plate and chill in the freezer for 5 minutes (do not over chill). Transfer the dough to a lightly floured counter and roll again into a 12-inch square. 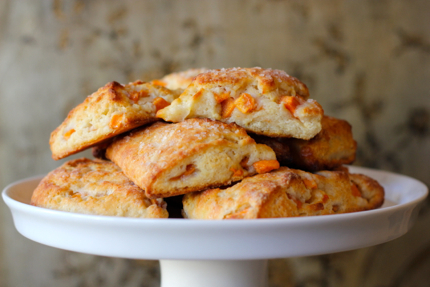 Sprinkle the diced persimmon over the dough and press lightly into the dough. Loosen the dough from the counter, roll it into a tight log, and pinch the seam closed. Lay the dough seam side down and press into a 12 by 4-inch rectangle. Using a floured chef’s knife, slice the dough into triangles. Place the scones on the parchment lined baking sheet. Melt 1 oz of butter and brush over the scones. Then sprinkle lightly with sugar. Bake until lightly golden brown, 18-25 minutes, rotating the baking sheet halfway through baking. Cool on a wire rack for 10 minutes. Serve warm or at room temperature. Tips for making ahead: Cut, unbaked scones can be refrigerated for up to 24 hours; bake as directed. They can also be frozen for up to 1 month; cover and freeze the scones until frozen solid, about 6 hours, then transfer to a large zipper-top bag and keep in the freezer. 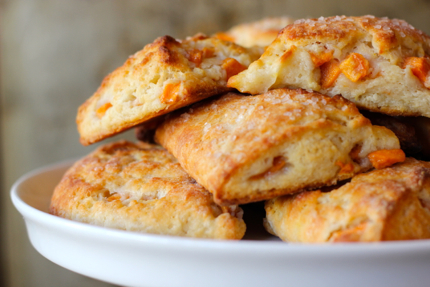 Bake the frozen scones (do not thaw) at 375 degrees for 25-30 minutes.